Canadian Geese are beautiful animals and watching them could be fun and can even be a stress reliever for many people. But in actuality when these birds are found in great quantities, these beautiful creatures can go from majestic to nuisance in no time. It is not a good idea to try to scare them away using your body language because although some Canadian Geese will get scared and fly away, others may become quite defensive and get aggressive. Because of this risk you may want to leave the dirty work to a dog. Though many dogs will chase the Canadian Geese, some will do so a lot better than the others. In this term better would mean gathering the entire flock and driving them in one direction-away. For this task the herding groups of dogs are the best for the job because they were bred for driving animals to a destination. The herding motion will in most cases get the geese to fly away. Here are three ideal canine breeds that are often employed with this task. The Border Collie - As it was said before, every dog is likely to chase the Canadian Geese and get them to fly away. A beagle will chase the geese, but it will do so more as a playful motion than as a herding dog. The Border collie was bred for herding and will do some of the best work getting the geese out of your property. 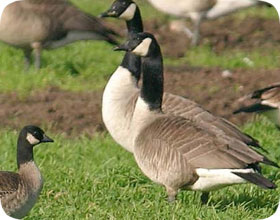 Border collies are bred to herd without harming the Canadian Geese. They are one of the smartest dogs you can own and this is what makes them perfect for the job. You would possibly be surprised to know that there are companies and even cities that will rent a trained border collie to clear a park or a runway of a flock of geese that have tried to settle in. Because the Border collie is a dog that needs a lot of exercise it will be happy to participate in herding. German Shepherd - The German shepherd is another very smart breed of dog. They can be trained to do just about anything that humans think necessary for a dog to do. They are great police and guard dogs and they are perfect as companions of people with disabilities. Because of this superior canine intelligence they are also perfect for helping you with your geese problem. They will follow your instructions and learn quickly how to herd the birds away. They are also very brave and big enough that a Canadian goose will likely think more than once before standing up to a German shepherd. In case one of the geese does get aggressive the German shepherd that is well trained will quickly make it change its mind without ever harming the bird. Training the German shepherd is extremely easy because they are quick learners and they are also a great guard dog for your family. Australian Cattle Dog - The Australian cattle dog closes out the list as the third best dog to deal with your Canadian geese problem. Like the other two breeds previously mentioned, the Australian Cattle dog is incredibly smart, but it also has something else; if you think that the geese are consistent you will think that no creature can be more persistent than this dog. The dog has a lot of stamina and it will chase Canadian geese all day if allowed to. This dog was bred for herding long distances and because of that it will not mind working all day long herding the Canadian geese that arrive in your property. Your Options - Depending on what you want to do there are a few options to get canine help with your geese. Some people choose to select a dog of their choice from the ideal breeds and then find a trainer. Others want to purchase or even lease a dog that is already trained for doing this. There are also some people who just use a service. Depending on what you’re looking for there will be some pooch ready to come to the rescue. Go back to the main Bird Removal page for more information about using dogs to scare Away canada geese.